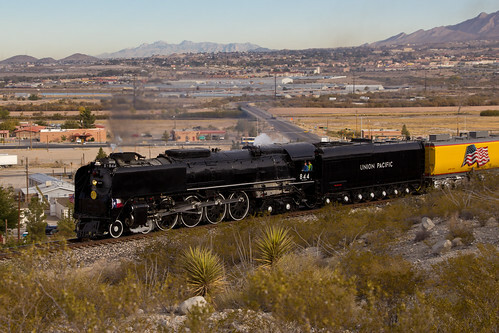 El Paso was host to a locomotive legend over the past couple of days. 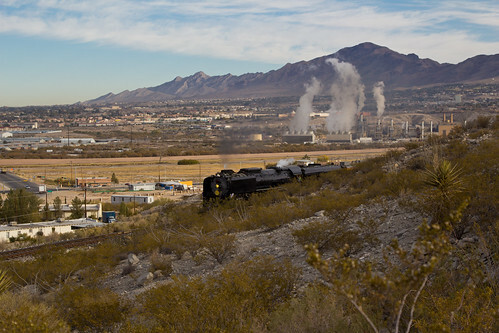 The Union Pacific 844 had stopped in town and was on display downtown before it headed out west. Union Pacific was going to run it trough Anapra on its way out so I wanted to get a picture of it as it passed by Ardovino’s Desert Crossing. I had scouted a location to shoot from on Tuesday trying to get the timing and lighting right. 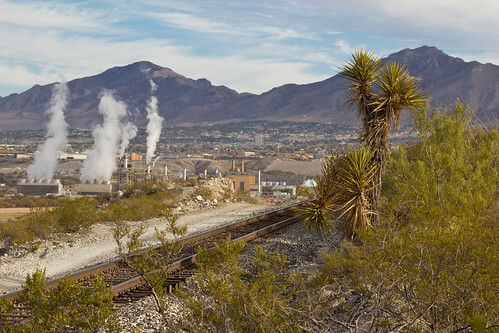 The tricky thing is there are two lines that run along Mount Cristo Rey in that area and I wasn’t sure which one it was going to be on. While I was scouting, a diesel cruised by at 8:15 on the upper track. I assumed the 844 would follow the same plan on Wednesday. On Wednesday I headed out to Ardovino’s arriving a little before 8:00. There was some other photographers there scattered around. I headed out to my spot and proceeded to wait in the cold. Two guys had followed me and setup across the tracks to my left on a flat area between the two sets of tracks. After about five minutes “Ramon”, as his buddy was calling him, asked how I knew it was going to be on the upper track. I told him it was a guess based on what I had seen on Tuesday but that I didn’t know for sure. After a few minutes we could here the 844’s whistle in the distance so we all patiently waited. At about 8:23 the older guy with Ramon could see the train in the distance and let me know that darn-it, it was on the lower track. They quickly reset their positions and I jumped down from mine so I could see the lower track. As soon as I recomposed a shot it appeared around the bend. I was a bit farther away and not as much of the mountains were in the background as I wanted but I still got a couple of good shots.